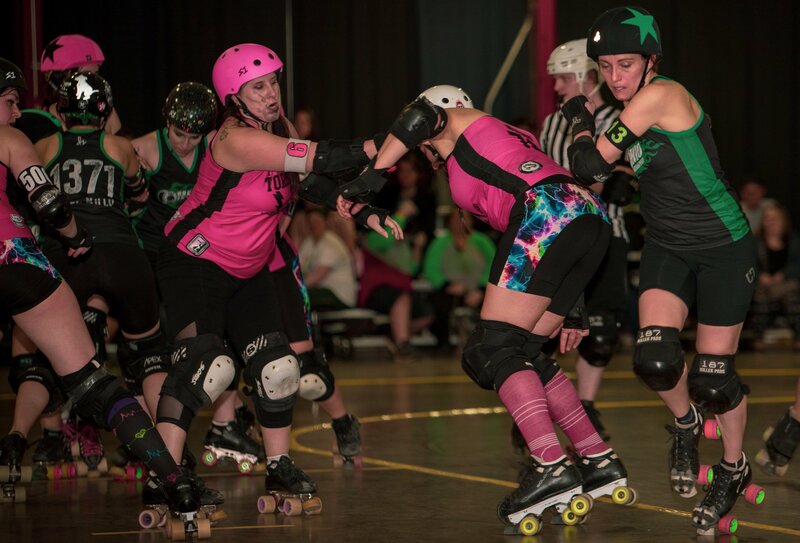 Returning once more to their home track after a long off-season, Ohio Roller Derby welcomed perennial adversaries Toronto Roller Derby to Columbus, playing two action-packed games for a nearly sold-out crowd. Aiming to both maintain a perfect record against Toronto and disrupt their 13-game win streak, the Ohio Roller Derby All Stars rolled with multiple lead changes in the first half before tightening defense, committing to a core veteran jammer rotation, and denying points in crucial moments to secure their victory. Both teams spent the first few jams feeling out one another’s defense, swapping a scant handful of points. A penalty on the Toronto jammer allowed Catch Mikachu to make the first bold move for Ohio and pick up 12 points in jam 6; Toronto responded with back-to-back shutout power jams, posting 24 points for the first lead change of the game. Quick offense helped BrussKnuckles to snag lead and a quick 4 points, but momentum ground to a near halt in jam 11 as Bigg Rigg and Monster Muffin each fought immovable walls. Mikachu swung the momentum back in Ohio’s favor with a second lead change, posting a 13-0 gain while the home defense prevented an initial pass by the Toronto jammer for two full minutes. 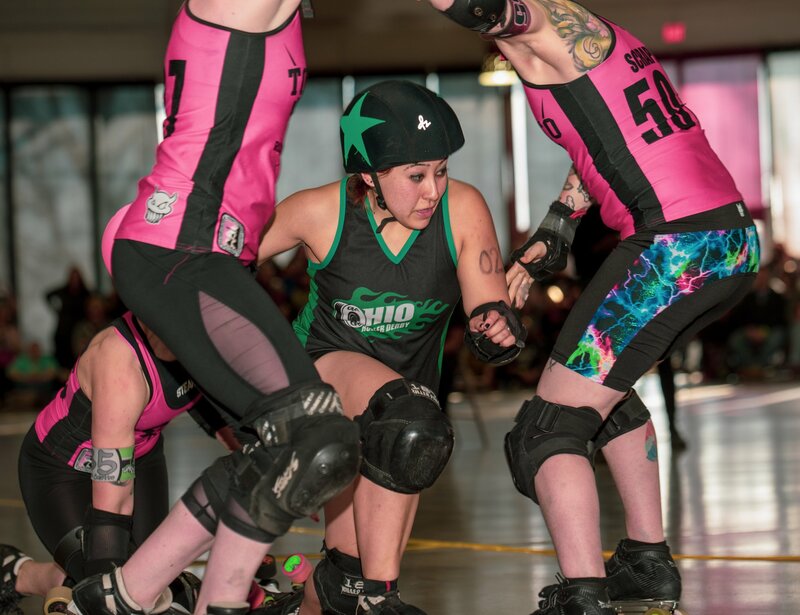 Leading 38-37, Ohio remained unfazed by jammer penalties in jam 13 and continued to tack on points as Lara Del Rage provided agile support to a defensive tripod. After a time-out allowed them to reset, Toronto barreled back into the lead and held Ohio scoreless over three jams despite merciless defense by Vyles and rookie Baby Kakes. As penalties piled up on both sides, Chainsaw forced a track cut on the Toronto jammer, helping Mikachu to pick up lead on her return from the box and push Ohio within 5 points of retaking the lead by halftime. Toronto attempted to regain their footing with 4 speedy points, but Ohio – a team known for their ability to recover in the second period – charged ahead, focusing on regaining lead and holding it just out of reach. 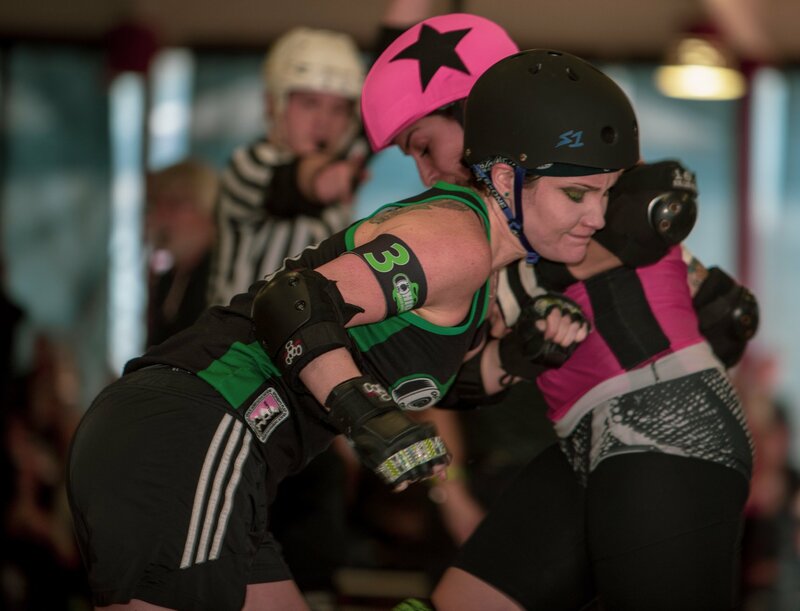 Mikachu twirled around the apex with assistance from Betty T. KayO and grabbed 8 uncontested points; a subsequent power jam provided time for BrussKnuckles to push Ohio into the lead, which they would retain for the rest of the game. 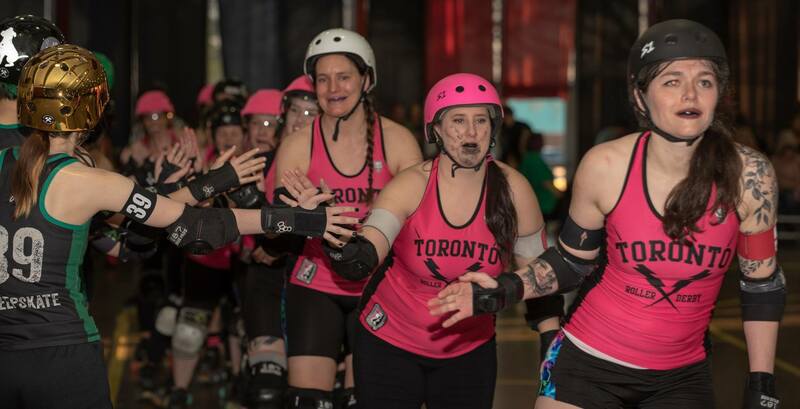 Bigg Rigg slipped through the pack to pick up lead status and 4 points in jam 24, while the Toronto jammer and pivot both earned penalties on a failed star pass. Running with a power start, Mikachu escaped the pack and opted to run the jam long to widen the point spread as Banshee returned to the penalty box. With just over half the period remaining, Toronto’s jammer picked up a double penalty, allowing Betty T. KayO to break up their defense while Bigg Rigg extended the lead to 121-91. 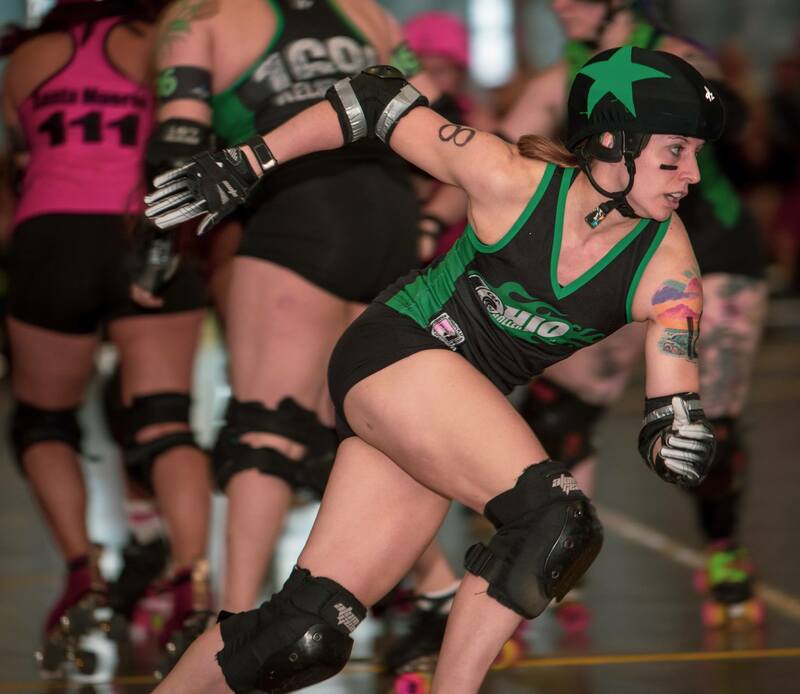 Not content with a 30-point differential, Ohio jammers increased speed, shutting out Toronto when lead and otherwise limiting them to single scoring passes as Kelsey Khaos rained hits on opponents. Ill-timed penalties prevented Toronto from making a final run toward victory in the final five minutes of the game; Mikachu and BrussKnuckles posted a combined 14 points, and one last power jam secured the win for Ohio, 150-121. MVPs for Ohio were Catch Mikachu (jammer) and Chainsaw (blocker). MVPs for Toronto were Banshee (jammer) and Commander Will Wrecker (blocker). Unofficial lead status gain, jamming, and scoring for Ohio were: Catch Mikachu (8-15, 103 pts); BrussKnuckles (5-14, 23 pts); Bigg Rigg (6-11 [1 star pass], 18 pts); Betty T. KayO (0-3 [2 star passes]; 2 pts); Birch Slap (0-1, 0 pts); Belle A. Trix (0-1, 0 pts); Chainsaw (0-2 [2 star passes], 4 pts); and Kelsey Khaos (0-3 [2 star passes], 0 pts). Unofficial lead status gain, jamming, and scoring for Toronto were: Banshee (8-13 [1 star pass], 47 pts); titmouse (0-1, 0 pts); Trial by Fury (2-10, 18 pts); Monster Muffin (2-5, 8 pts); Red Zeppelin (6-13, 33 pts); Santa Muerte (0-1 [star pass], 0 pts); Jamie’s Got a Gun (0-1 [star pass], 0 pts); and Commander Will Wrecker (1-1, 3 pts). Fielding a blended roster of long-time veterans and recent rookies, Gang Green put up an admirable fight against the Toronto B squad in the second game of the evening, but were ultimately unable to overcome the early lead gained in the first period. Much like the All Stars game, both squads needed several jams to assess their opponents and settle into the rhythm of play. After three speedy, scoreless jams, Toronto took advantage of a power jam to open a 16-0 lead, but staunch defense by Foxy Force, Oxford Coma, and Lara Del Rage forced Pancake into a penalty the following jam. Smash Panda earned the first lead status for Gang Green in jam 7, battling a Toronto tripod to pick up 4 points. Finding their stride, Gang Green began to take chunks out of the early Canadian lead with four lead jammer statuses in a row. Toronto looked to exploit a 4-2 pack advantage on a power start, but Baby Kakes and Kegel Scout detained their jammer long enough for Smash Panda to return from the penalty box, slide around the outside line, and pick up lead. Low numbers for both teams worked in Gang Green’s favor in jam 12 as Smash Panda doubled the score and narrowed the differential to 32-39. Toronto responded aggressively, doubling their own points over the next three jams, but an apex jump by Jane, Literally at the conclusion of jam 15 garnered 4 more points for the home team. Capitalizing on power jams and fighting against full-strength walls for the remainder of the period, the teams traded points while swapping jammers in and out of the penalty box and rolled into halftime with Toronto leading 87-48. Belle A. Trix ran up the inside line for 7 points to kick off the second half, and Smash Panda and Jane, Literally minimized the point bleed with fast feet, finding lead status quickly or chasing down opposing jammers. 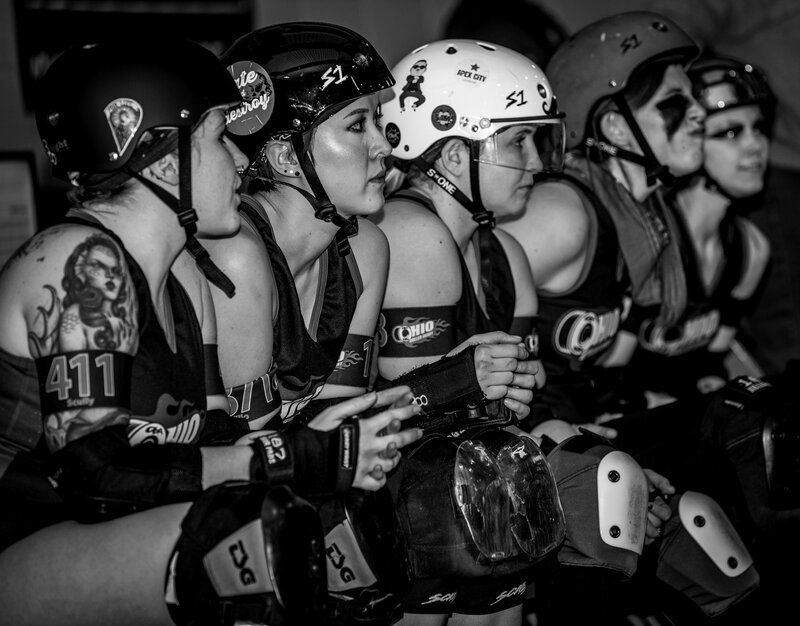 An illegal assist sent Banshee to the penalty box in jam 25, providing room for Belle A. Trix to juke by on toe stops to snag lead and scoop up 8 points while Lara Del Rage brought the Toronto jammer to a halt on their return to track. Scoring stagnated at 93-67 in favor of Toronto for several jams before their defense could hold the Gang Green jammers long enough to make progress. Jane, Literally stole lead status in jam 30, easily hopping the apex for 4 points while her teammates stymied Motley Crude, pushing the score to 71-124. An official review requested by Toronto allowed Gang Green to reset and earn lead jammer in consecutive jams; Smash Panda briskly raked in 4 points, then No won a hard-fought battle on a power jam. 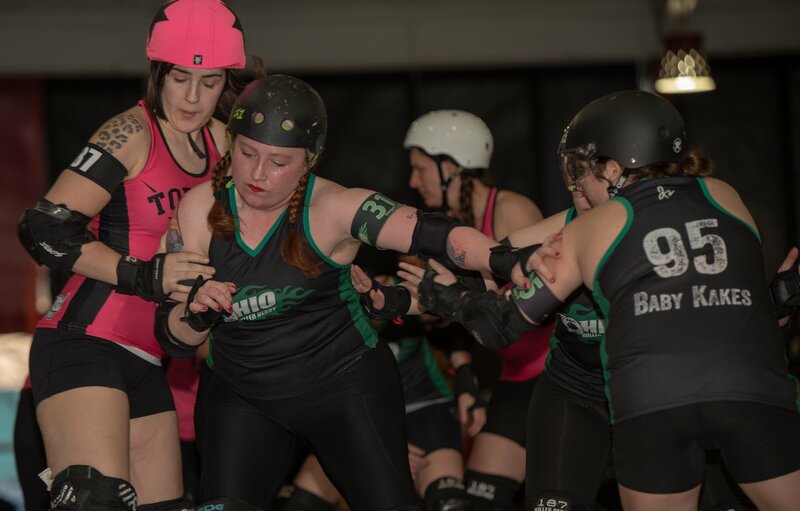 Toronto answered with a 15-point jam, wedging open their lead once more, but Belle A. Trix nabbed lead and 7 points in jam 39 as the opposing jammer earned a penalty for blocking with the head. Despite exhaustion becoming a factor in the final moments, Smash Panda shed blockers and squeezed out 3 more points to end the game with an official score of 92-161. MVPs for Gang Green were Smash Panda (jammer) and Lara Del Rage (blocker). MVPs for Toronto were SioBAMM (jammer) and Fleetwood Smack (blocker). Jammers for Gang Green were: Belle A. Trix; Jane, Literally; Smash Panda; TactiGal; No; Ka-Pouch! ; and Baby Kakes. Gang Green obtained lead jammer status in 20 out of 40 jams. Jammers for Toronto All-Stars B were: Pancake; SioBAMM; Mina Von Tease; and Banshee.